Diamond Details: 240 Round brilliant cut white diamonds of F color, VS2 clarity, and of excellent cut and brilliance, weighing .96 carat total. 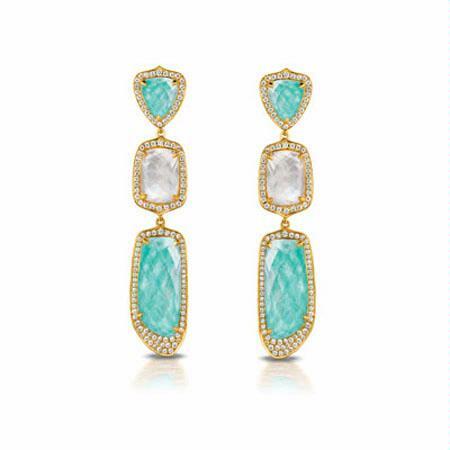 Gemstone Details: White topaz stone layered over amazonite stones, of exquisite color, weighing 15.56 carats total. Gemstone Details: White topaz stone layered over mother of pearl, of exquisite color, weighing 3.85 carats total. This stunning Doves pair of 18k yellow gold dangle earrings, features white topaz stone layered over amazonite stones, of exquisite color, weighing 15.56 carats total and white topaz stone layered over mother of pearl, of exquisite color, weighing 3.85 carats total with 240 round brilliant cut white diamonds of F color, VS2 clarity and excellent cut and brilliance weighing .96 carat total.